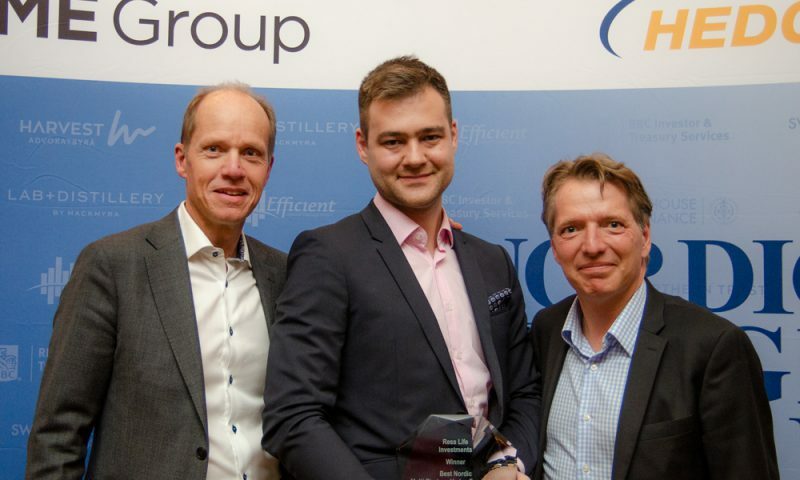 Resscapital AB is pleased to announce that our fund Ress Life Investments was awarded Best Nordic Multi-Strategy Hedge Fund in 2018, by HedgeNordic at a ceremony held in Stockholm on 10 April 2019. The Award is designed to celebrate the best and most promising Nordic hedge funds that manage to maintain high levels of absolute and risk-adjusted returns over a longer period of time. Ress Life Investment had a net return of 9.9% in 2018. During the last five years the volatility of the fund is only 4% and the risk-adjusted return, measured with a Sharpe-ratio, is an excellent 1.4. Furthermore, the fund has had positive returns in 75% of all months, and the maximum drawdown is 1.3%. During the same time, the correlation between the return of the fund an that of global equities (MSCI World), is 0.0. “We are delighted that our fund has received the award “Best Multi Strategy Hedge Fund” in 2018. It is a strong recognition that our portfolio management strategy is able to deliver a high uncorrelated return to our investors.”, says Gustaf Hagerud, Managing Director. Low volatility – a well-diversified life insurance portfolio offers investors stable and attractive risk-adjusted returns. Monthly historical volatility during the last five years is 4%.